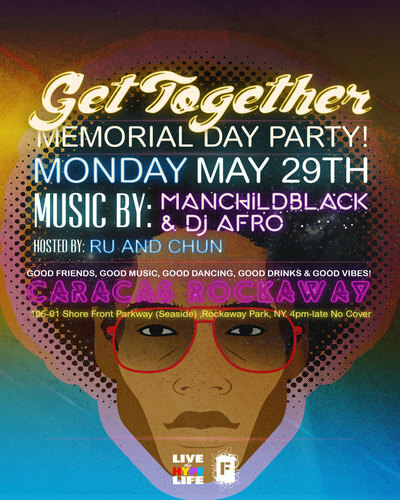 Let's Get Together NYC this Memorial Day Monday, May, 29th, for a day/evening of good music, good friends, good food, good drinks and good vibes along the Rockaway Beach boardwalk!!! Residents Manchildblack (The Illustrious Blacks) & Dj Afro (Los Amigos Invisibles) will spin the best in Funk, Soul, Disco, Afro and Latin influenced dance music to keep you dancing! Also, Ru & Chun will be on hand to host the holiday festivities at Rockaway Beach hotspot Caracas Rockaway! TRANSIT: Take the A train to Broad Channel. Tranfser to the S (Rockaway Park Shuttle) train to Beach 105 St.
Let's Get Together NYC and dance in the sun!! !